I agree - was probably the biggest move. at last someone plays on tengen. Let's go around the wall, then! Oh, that one is closed, too! Where can I go? There's no place for me in this small world! I'm running amok! At least I don't have to think now. At least that's what I think. I want to defend that corner. I want to defend that side, too. It may be too ambitious, but I want sente. unkx80: I don't like , , and . I am a bit tired to comment precisely on this, but please see Add a second stone and sacrifice both for more information. (Sebastian:) Do you mean, you don't like because it allows and ? D o you mean, White should have extended the stone in atari like this? You surely can't mean that you dislike and - they are similar to the proverb in that they extend a single stone - and they even save it. 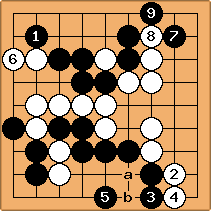 unkx80: The correct sequence for White should be in this diagram, which fully utilizes all the aji. Of course, should be played at . (Sebastian:) Thanks, I see what you mean. 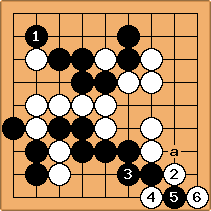 I wonder if Black can instead of play like this, which give him good follow-ups at a and b.
HolIgor: In responce to white would never play . 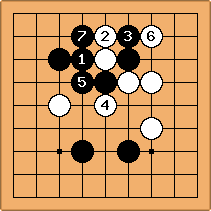 White would play at b and black would be forced to play at 2, then white plays a and closes in sente. Black gains nothing. 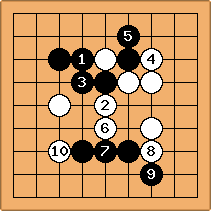 If black plays 7 in the previos diagram, he can push once later at a, and if white plays a forcing black to capture, there is a yose at the edge left. (Sebastian:) Too late now. Seriously, is there anything important I didn't see? Please let me know or give me at least a hint. is what I had in mind. If is elsewhere, White is clearly better off than in the game. Each corner play is big, now, but I think is best. 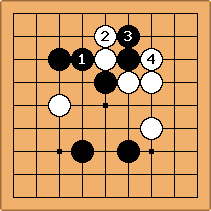 Since Black is connected, White is the one who has to worry about life and death instead of Black, as in the game. (DosGatos) Later I read ProtectingTheCutExample1 and learned I should have played at a. : ( Though I don't think it would affect my territory in this case. (Sebastian:) Please feel free to undo. (To be honest, I've done that already a couple of times!) I play much rather with the agreement that, as long as the opponent hasnt' replied, we can still change our moves. As a side effect, this also works as an encouragement to move quickly. 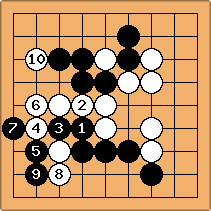 In the unlikely event that the undo was because of a Kibitz's comment to that particular move, we'll ask the opponent. Sounds good? 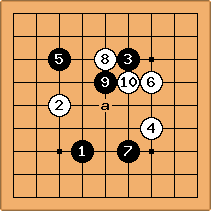 Bill: In diagram "moves 31 - 40", if is at a or b, is not White's sente. In fact, is Black's sente. Big difference. DosGatos: Do you mean Black would get a sente in this way? unkx80: I think Bill meant, Black at is Black's sente. Bill: Thanks, unkx80. :-) I was referring to the diagram above, as I think I have now made clear. 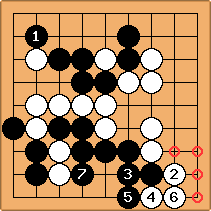 In this diagram, Black's local reply to is . 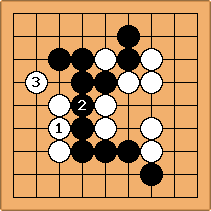 Also, with this sequence it looks like Black needs to keep White from playing there. To address Dos Gatos's question, after in this diagram, the next play looks relatively small. 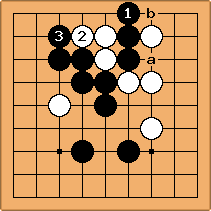 Later, is sente, and we expect that Black will be able to get it in with sente. Then, instead of the four points, White will get only one, which is three points better for Black. BTW, this is a very interesting position. Maybe I was wrong about it's being Black's sente after . DosGatos: I still don't get it (I am a beginner!). Black should come this way? unkx80: Did you resign too early? See Beginner Exercise 167.